Marie Henein, probably now the most famous and prominent defence attorney in Canada, has written an open letter to Premier Ford in The Globe and Mail which corroborates the argument that I put forward here on Parliamentum yesterday: the Notwithstanding Clause has come to seen as unconstitutional in the British sense of the word despite being part of the Canadian Charter of Rights of Freedoms. In a gleefully patronizing tone, Henein admonishes Ford for not understanding Canada’s system of government and accuses him of having supplanted the rule of law with a form of personal rule worthy of a Latin American caudillo, eastern European autocrat, or a Stuart king. Indeed they are. But since Section 33 of the Canadian Charter of Rights and Freedoms, more commonly known as the Notwithstanding Clause, is part of the Constitution of Canada, it logically follows that using Section 33 as prescribed is constitutional and lawful. If anything, the only person who does not agree with “the law” or with governments acting in accordance with law and the Constitution of Canada is Marie Henein, who here denies the constitutionality and questions the legitimacy of the Notwithstanding Clause. By that logic, if Section 33 undermines the judiciary, then judicial review undermines the legislature. The Notwithstanding Clause should not be treated as an aberration but instead regarded as a fundamental and key feature which reinforces the checks and balances and separation of powers within the Constitution of Canada in the same way that the Reasonable Limits Clause does. It allows the legislature to check the judiciary and preserves in limited form of British parliamentary sovereignty versus American judicial review. 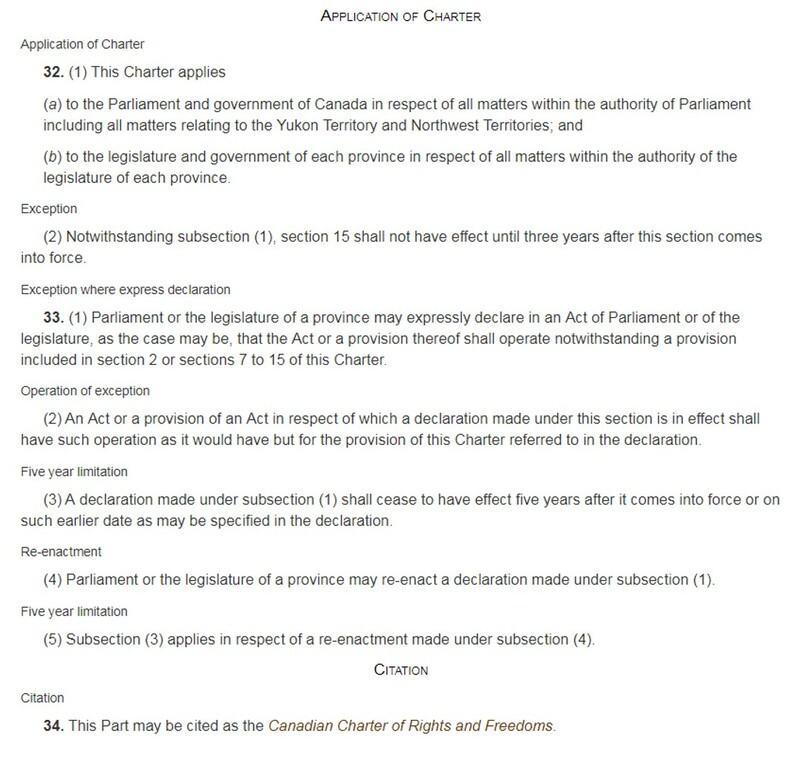 The Notwithstanding Clause further preserves legislative sovereignty because any statutory provision which invokes it automatically expires after five years, which forces the next parliament or legislature to re-consider the issue and deliberate anew. The Notwithstanding Clause thus upholds one of the main principles of parliamentary sovereignty, that one parliament cannot bind its successors. Based on the assertions contained in this open letter, I’m not convinced that Henein would be best suited to teach anyone about Section 33 of the Canadian Charter of Rights and Freedoms. Someone who so fundamentally misunderstands the Notwithstanding Clause should not take such great relish in condescending to the Premier on its use. The better view is that the Premier has acted constitutionally and lawfully. Whether or not the Ford government should have tabled Bill 5 and then Bill 31 is a political question, not a legal-constitutional matter. Ford has spent a great deal of political capital pursuing this issue and risks looking petty and vindictive; the Conservatives could well end up paying the political price in 2022 – or they might not; only time will tell. In the meantime, this veritable moral panic about the Notwithstanding Clause has only served to spread ignorance of the Constitution of Canada, which helps no one. This entry was posted in Constitution (Written), Notwithstanding Clause, Separation of Powers. Bookmark the permalink. Your 4th to last paragraph is totally excellent! The left hates the notwithstanding clause because it allows conservatives to push back against judicial activism. Thank you for both excellent articles on the Notwithstanding Clause. They brought research and logical thinking to a fraught subject. It was useful also to be reminded that the English-Canadian dislike of the clause might well have its roots in its use by Quebec in the defense of its language laws. Finally, I read the Marie Heinen open letter and was very disappointed in someone who had been my heroine: her argumentation was weak to non-existent, and you demolished it; her tone was offensively sarcastic; and – though I see you dislike red pens – her writing was sloppily vernacular… not the way to make winning arguments. Not being more than an interested layman on Canadian constitutional issues, my view is that whatever Ford’s goals are, why did Bill 5 need to be rushed through and apply only to Toronto on the eve of an election? My reading of the ruling is that if the bill had been passed a week after the election to commence at the next election, it would have been upheld. Because political issues are mucking with the machinery and conduct of an election, the court felt justified in pausing the political question at this time. I think the bigger constitutional problem is the use of the Notwithstanding Clause to directly challenge the courts for political points seems like using the letter of the law to violate the spirit of the law. Further, it opens the doors to attempts to delegitimize the courts. Was there an intention that the clause could be used to simply overrule judicial review because politicians didn’t like it? I believe that titling individuals, beyond their first mention, is a fading convention. Also, being an American who laughs at over-deference and “decorum” when calling long retired individuals by some highfalutin title, I like the Commonwealth’s acceptance of reality. Mr. Ford happens to be the Premier of Ontario, but that really isn’t his title. So it is perfectly fine calling him Ford when context is clear.